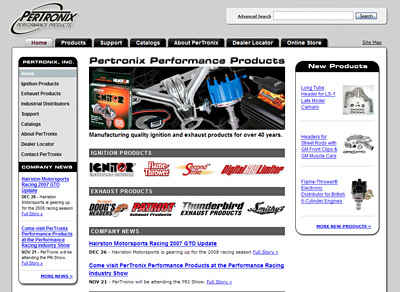 Home Portfolio Project: PerTronix Inc.
Pertronix, Inc. recently began their fourth decade as a market leader in the electronic performance ignition industry. Substantial growth has made it necessary for PerTronix to expand production and relocate to a brand new 22,000 square foot custom manufacturing facility. By the end of 2006, the company's Ignitor kit sales exceeded 3,000,000 units. 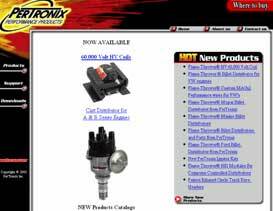 Although PerTronix was making tremendous strides in the automotive industry, their web site was in dire need of a complete redesign and performance overhaul. Kind of like our web developer's 1986 Ford Mustang GT. Expanded sections, product information, and dealer resources. Improved dealer locator to find a PerTronix Dealer closest to the site visitor. SQL Server 2005 used to manage all site data. The Exhaust Products section. It's simple and very streamlined compared to how it was before. It's also a lot more interesting to browse around. The PerTronix, Inc. Web Site was our most interesting and most enjoyable web site projects to date. And we learned more about cars, ignition, headers, and exhaust systems then we ever thought was possible! They are a great group of folks over there---so go check out their site!